You just landed a client you’ve been pitching for a while and want to make her event spectacular. After rejoicing for a couple of hours after getting the contract signed, you can reach a state of planning block where you are so overwhelmed with the task in front of you that you do not know where to begin. We have summarized eight very important categories to help you begin planning the even while making sure you cover all areas. These eight categories apply to most events including weddings, corporate parties, social gatherings, grand openings, birthdays and more. 1) Attendees: Who is on your attendee list? Have you triple checked it to make sure everyone who should receive an invite has received one? 2) Attire: What will be appropriate attire for the attendees of the event? What will your attire be? 3) Anticipation: How will you build anticipation for the event? Will you send out “Save the Date” cards? Will you send gift bags to attendees prior to the event? How will you notify everyone? Will you inform the press? Will you have a special website for the event? 4) Arrival: How will the guests be greeted upon arrival? Will someone welcome each guest or will they walk in on their own? What will their first experience be upon walking through the door? What will be the first thing they see? What are attendees parking options? 5) Atmosphere: What will the decor be at the event? Have you chosen the color scheme yet? What will your lighting look like? What types of fabrics will you have? Will there be a VIP area? 6) Appetite: What food will your event have? Will you have appetizers, main course and desserts? Will there be a fully stocked bar? Will your event have a signature drink? Don’t forget water, juice and soda to go along with alcohol and beer. Food is very important at most events. 7) Amusement: What will the amusement and entertainment of the event be? Will you have n emcee? Will there be music? Other examples of amusement can be a photo booth, gift bags, cigar bar, oyster bar, and dancing. 8) Appreciation: Will you mail thank you notes to attendees? Will they leave with a guest bag? How will you make sure your attendees remember your event and feel appreciated? So start by writing these eight categories onto a sheet of paper and brainstorm all applicable details under each category. This will help you flush out your ideas and align them with your client’s objectives. 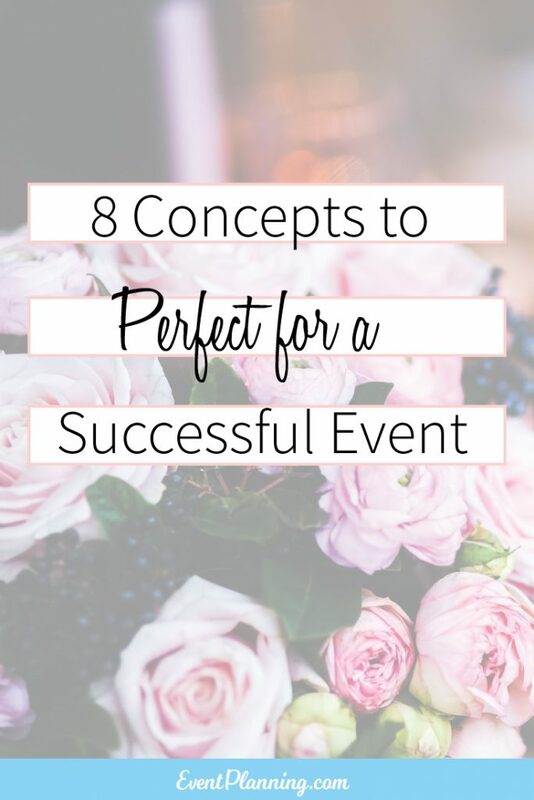 By keeping your ideas organized into these categories, you will remain calm be able to plan well throughout the lead up, event and post-event. You can also include these eight A’s in all of your proposals too. By putting them into a power point presentation with a little text and nice imagery you can really impress your prospects. Love these 8 categories. Very helpful, thanks! Could I use these for a wedding too and would you recommend I make any modifications for a destination wedding with these? Thanks in advance! this is what have been worried about ,big thanks to you, pls, can I have more strategies?